A narrow island-littered inlet of the Pacific Ocean is all that separates Seattle from the Olympic Peninsula, but they are worlds apart. While Seattle has been squeezed between mountains and ocean, the Olympic Wilderness has remained largely (literally) undisturbed. I couldn't wait to get there. But first we had to get out of Seattle, early on a Monday morning. We'd decided not to take the Bainbridge Island ferry in case there were long queues. Also, my friend wanted to see the replacement for the Tacoma Narrows Bridge, which swayed and buckled its way into notoriety in 1940. 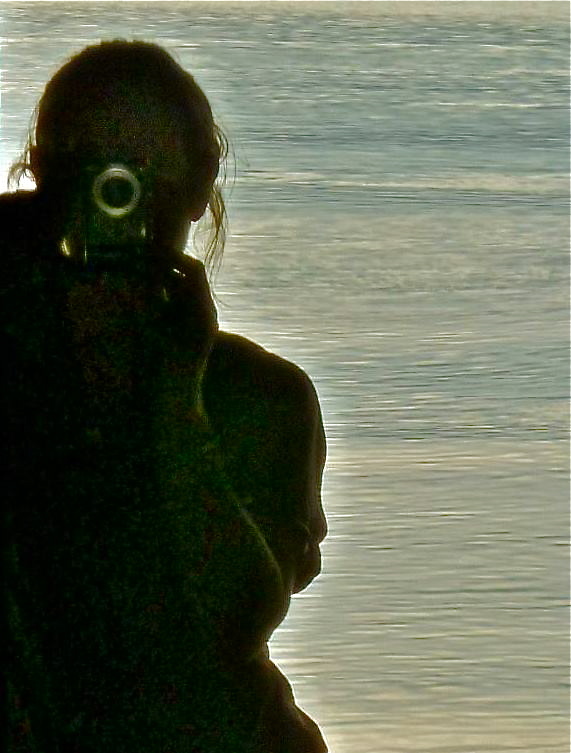 It was the wrong decision: there would have been a nice view from the ferry back to the city, for one thing. All went well at first on the I-5. But Flossie (satnav in the car, any car) didn't seem to know about roadworks at the junction we needed to take on to WA-16. Our exit was barred; we should have come off at the junction before. Many expletives later, we managed to get back on track. There was nowhere to stop to read about bridges old and new: my friend was not happy. Flossie had a fit near Bremerton, too, where she directed us the wrong way down WA-3. I wondered fleetingly if perhaps Flossie was the only person who knew that the Hood Canal Bridge wasn't open. It's the third-longest floating bridge in the world, carrying SR 104 across the Canal (which isn't actually a canal because it's not a manmade waterway but a fjord) to the Olympic Peninsula. A lady in a gas station pointed us in the right direction, however, and the rest of the journey to Port Angeles was uneventful. There was no other reason to come to this timber-exporting port except for its tourist information office. A couple of helpful gentlemen were able to answer all my questions… How long would it take to drive to Hurricane Ridge and back (one and half hours). Did we need a Discover Pass (yes, but we had to get it at the Olympic National Park Visitor Center on the road to the Ridge). Were there short walks to do once we were there (yes). Did they have a geology factsheet (yes). Given that we were staying that night at Lake Quinault, did we have enough time to visit Marymere Falls (yes); and to drive to Cape Flattery (definitely not). 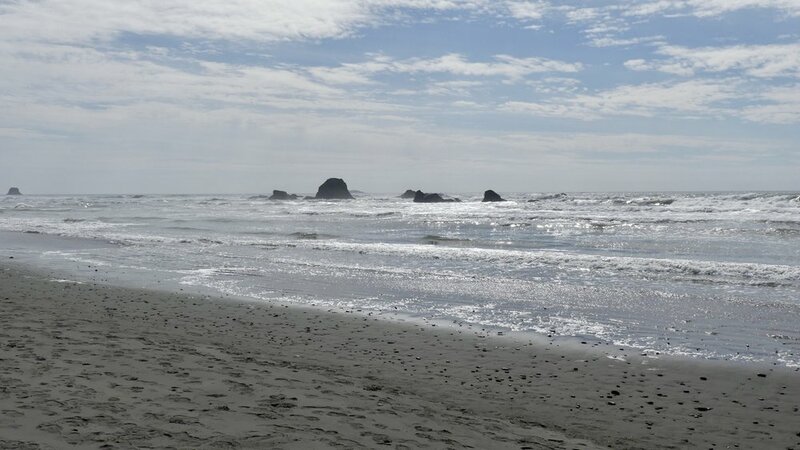 Where could we best see the Washington coast given our time restrictions (Ruby Beach). And where was the best place in town to get coffee. The Olympic National Park is a World Heritage Site. It sits pretty much in the middle of the Peninsula and has the Olympic Mountains at its heart. The Mountains are drained by 11 river systems, and have 60 named glaciers. The best vantage point for admiring them is Hurricane Ridge Lookout. It's 18 wiggly miles to Hurricane Ridge, and there's a 30 mph speed limit, which is as much to protect wildlife as to prevent you losing control on the bends. The name derives from winter storm fronts obstructed by the Ridge that produce 100-mile-an-hour winds over its top. The views at the top are little short of sensational. These are young mountains made of basalts from volcanic activity and sedimentary rocks uplifted from the seabed, both later sculpted by glaciers and other agents of erosion. Many areas of the National Park get in excess of 150 inches of rain a year, while the highest peak, Mount Olympus, at 7980 feet (2432 metres), receives more than 200 inches. The mountain was named after the home of Greek gods by British explorer John Meares as he sailed off the coast of Washington in the late 1700s. Still-snow-capped peaks merged into mist and cloud. We walked the half-mile Cirque Rim Trail. There was definitely a nip in the air. There were fine views of pointy-topped trees. But the snow, which lingers until August in these parts, takes its toll on them, breaking limbs and stunting growth. The harsh climate and foraging animals ensure fewer seeds take root, which is why trees stand in lonely clusters in places. 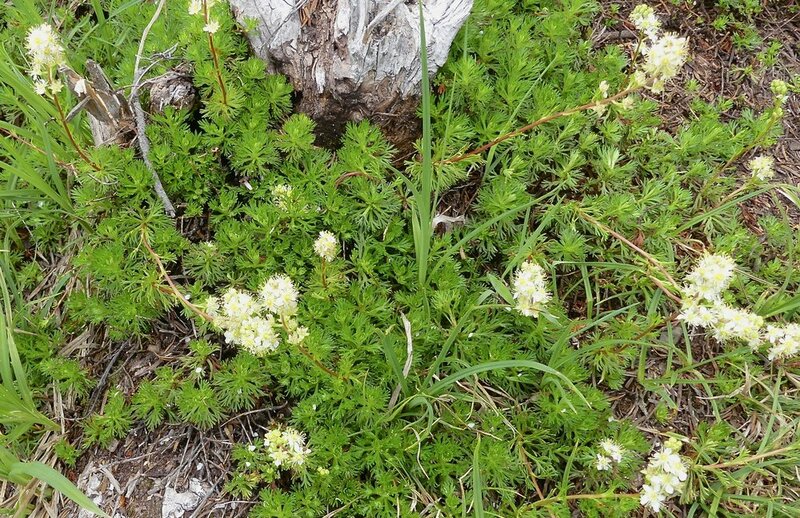 Clusters of white Partridgefoot flowers (above) have dissected leaves. This plant does well on bare ground so is useful for revegetation. The Columbian Black-tailed Deer didn't seem to mind walkers. 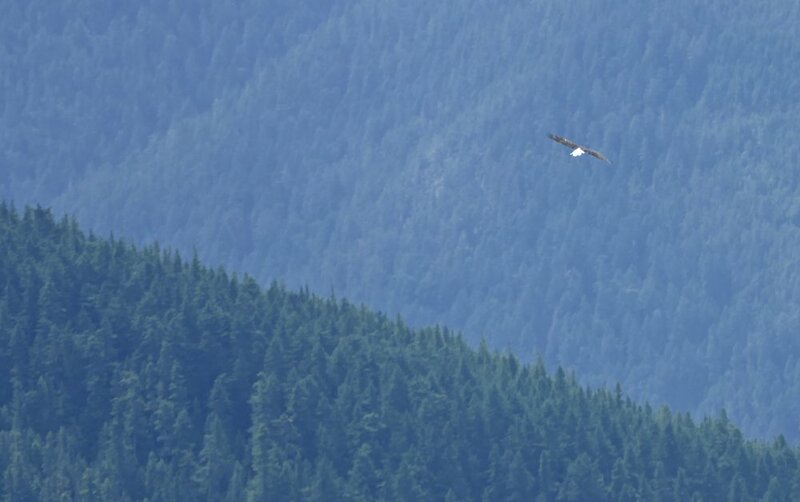 There was a surprise guest appearance by an American Bald Eagle, the national bird of the United States since 1782, and the only eagle unique to North America. It was high above us but the white tail was unmistakeable. It was time to go down the mountain all too soon and head west from Port Angeles on US 101, which, incidentally, extends for more than 1500 miles down to southern California, including over the Golden Gate Bridge. The traffic was the lightest we'd seen since we'd arrived in America. Instead, we were held up by roadworks by Lake Crescent long enough to have to sacrifice Marymere Falls for Ruby Beach. 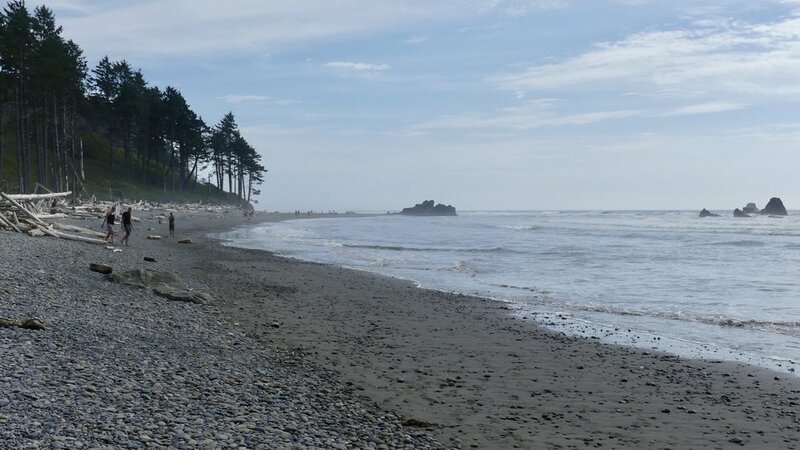 It would have been nice to detour to the coast at La Push (great name, along with Forks, nearby), where there probably wouldn't have been as many people to intrude into my photographs as there were at Ruby. The notice said: 'Beach logs are the bones of a rainforest picked clean by the sea.' Giant conifers grow in river valleys, where serious amounts or rainfall added to glacial melt undermine the banks of channels so that trees topple into the floodwaters and are carried as logs to the mouths of rivers and on to the shore. Trees also fall from cliffs that are being eroded. Unfortunately, rather like those who make piles of stones to show they've been there, people here had constructed edifices from the bits of branch and trunk on the beach. I really don't want to see these results of your self-indulgence: please desist. 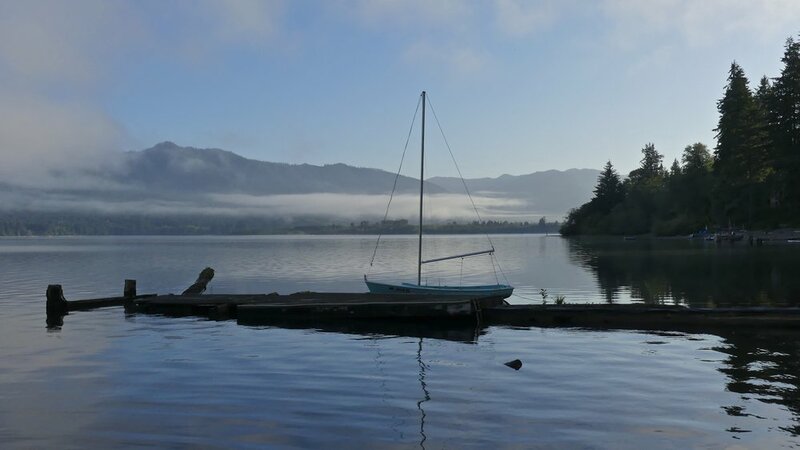 Lake Quinault really was tranquility base, especially after Seattle. It was particularly photogenic in the early morning and at sundown. 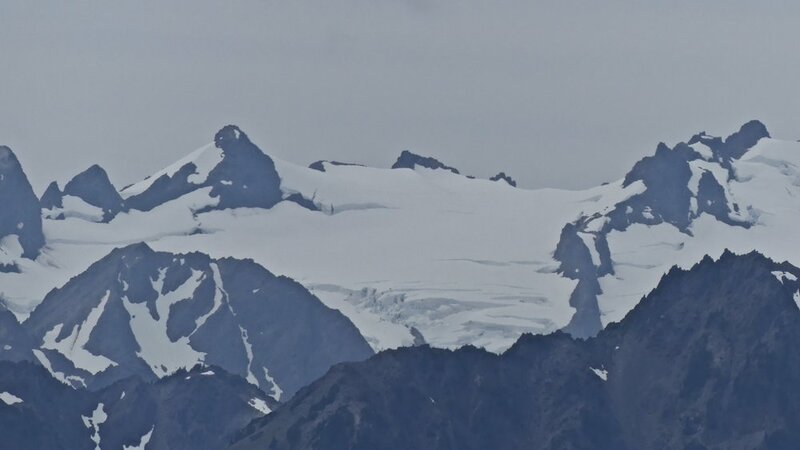 The Quinault River valley was shaped between 10,000 and 15,000 years ago by a massive ice sheet about 1000 feet thick which reached halfway up the hills in the pictures below. When the ice retreated, material it had been carrying was dumped in what is known as a terminal moraine. This dammed the valley, creating the Lake. 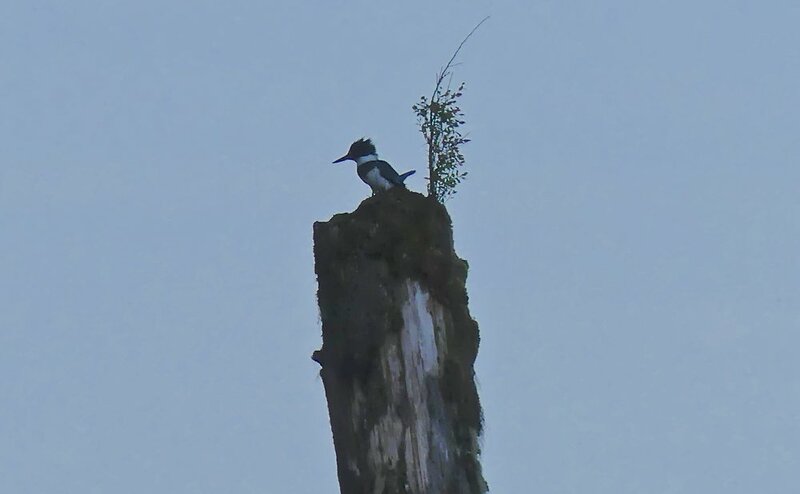 The Belted Kingfisher below left, sporting an impressive Mohican, had found the perfect perch from which to dive for food in the Lake. In contrast, the White-crowned Sparrow was foraging not far from Lake Quinault Lodge, where we stayed. 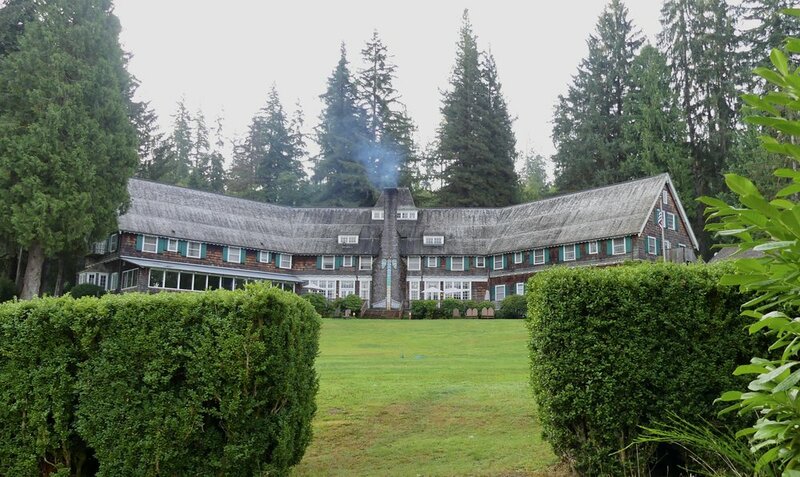 The Lodge dates from 1926, and its grounds are home to large Sitka Spruce and other 'sentinels'. 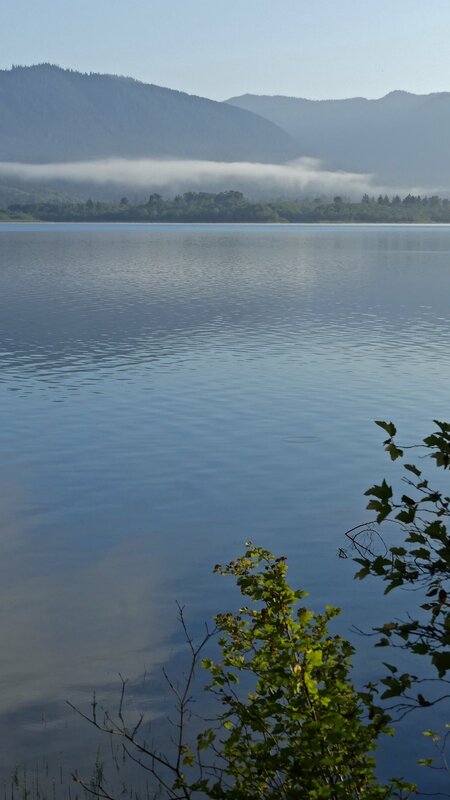 In the early morning of the following day, we walked along the lake through rainforest that receives on average about 150 inches of rain a year. It was misty and peaceful beneath the tall trees reaching for the sky. Before we left for the Oregon coast, we went to admire the world's largest Sitka Spruce. Many places claim to have the largest this or the biggest that, and you have no way of knowing if it's true. 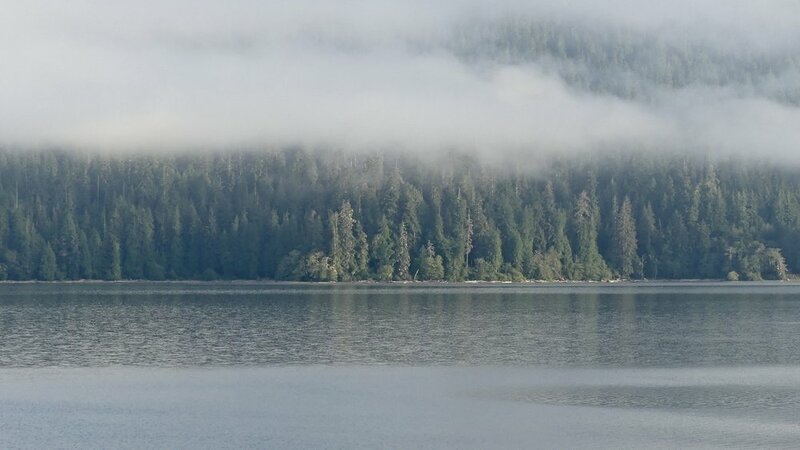 Sitkas like to grow within 20 miles or so of the coast, where moist sea air and summer fog increase the humidity. They can't control water loss through their needles, you see. The Quinault valley also claims the world's biggest Western Red Cedar, Douglas Fir and Mountain Hemlock; and the largest Yellow Cedar and Western Hemlock in the US. 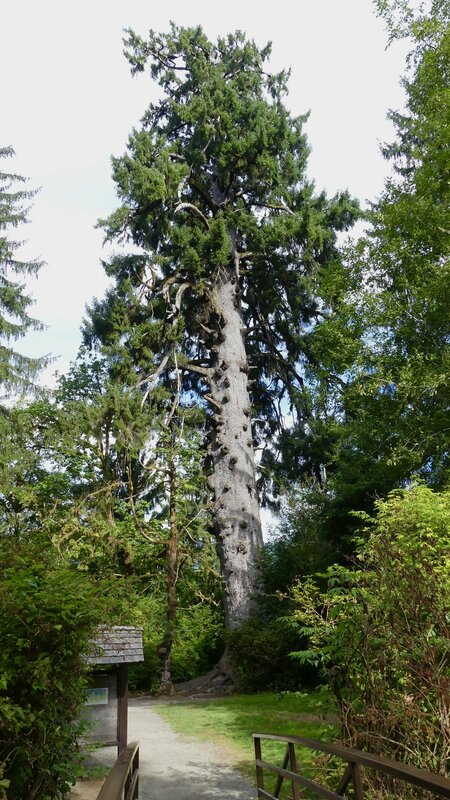 This Sitka Spruce is 191 feet tall with a circumference at its base of almost 59 feet. It is believed to be about 1000 years old. Only now do I regret not getting a person to stand by its side for scale.